The BLT. I don’t know many people who don’t like the combination of bacon, lettuce and tomato on a sandwich. It’s so simple, yet so delicious! To me it is one of those comfort foods like grilled cheese and tomato soup that just warms the soul. I started making this version about a year or so ago and honestly, I don’t think I have made them on bread since. Yea, they are that good. The combination of the home made honey mustard sauce just really makes the whole thing better. These are perfect game day food or for an appetizer for a party. You can make the bacon up ahead of time and they don’t take long to put together, so it is a quick and easy meal even if your in a hurry. These pair great with potato salad (I will post my recipe soon) or this Black Bean Salsa and chips. 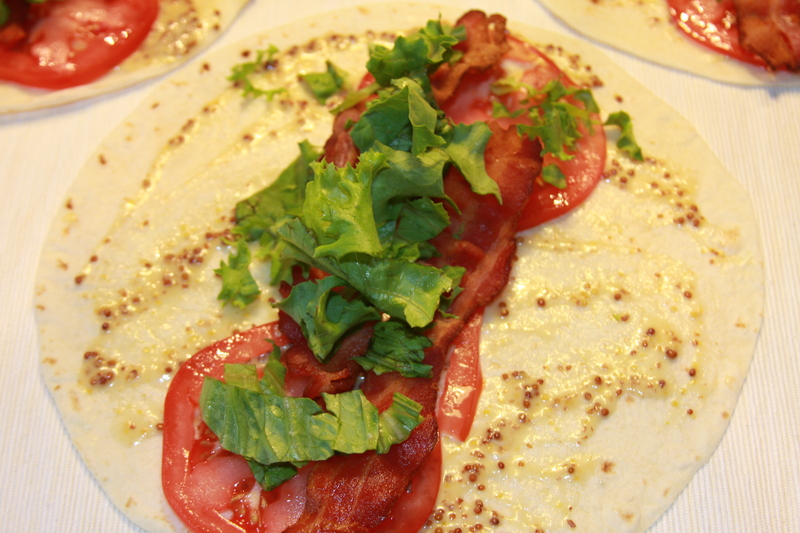 ** For the vegetarian version, you can substitute the veggie bacon. 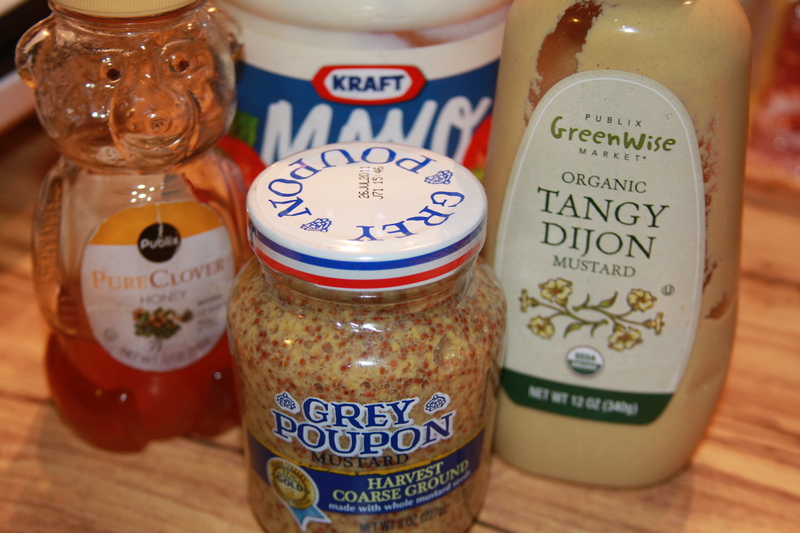 These are the combination of products I use for the honey mustard. I like the texture and flavor of both kinds of mustard in this recipe. I didn’t give total specifics on the honey or the mayo, only because people like their honey mustard different. Just go with the 4 tablespoons of the mustard and then you can add in the honey and mayo to your taste. Just add them all to a small bowl and use a whisk to make sure all of the flavors are combined well. 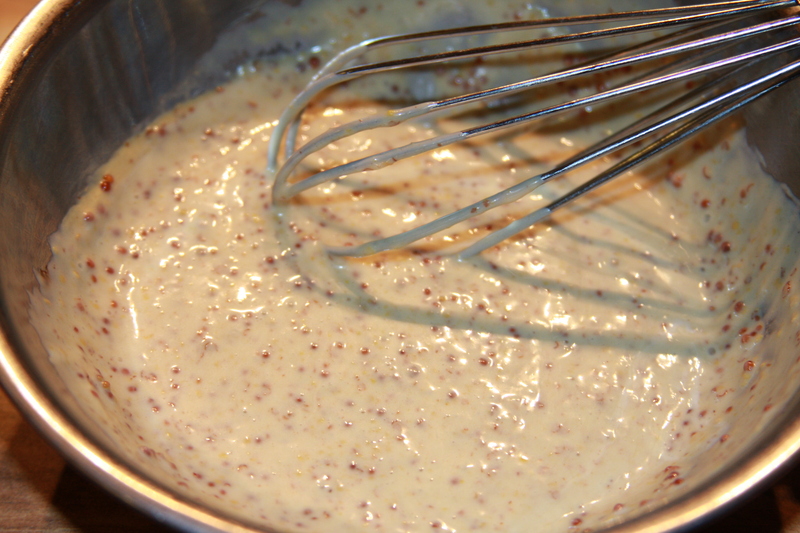 I am not a huge fan of honey mustard, but when I started making my own, I loved it! It is so much better than anything I have ever purchased pre-made. 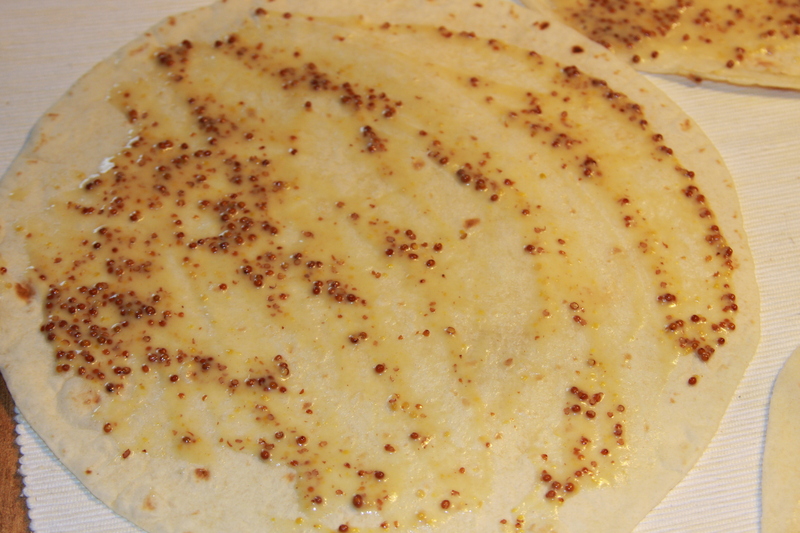 Lay out your tortillas and spread the honey mustard sauce across them. 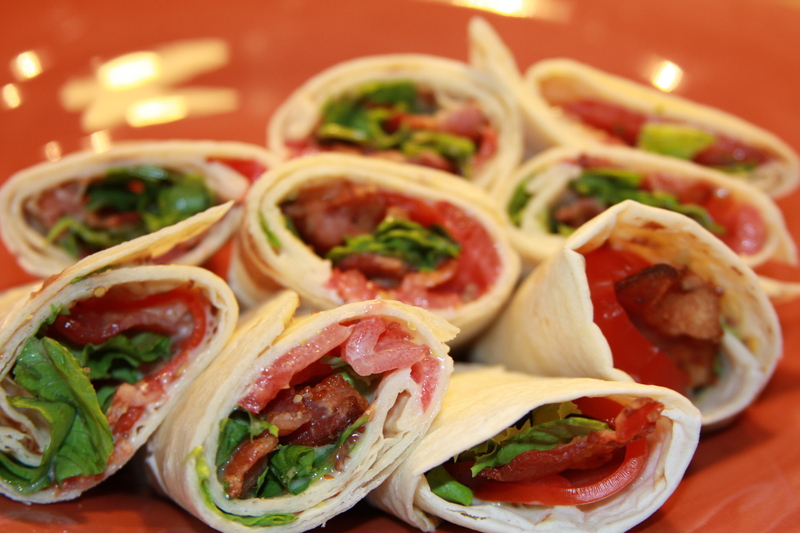 Top each with, 2-3 slices bacon, lettuce leaves, and 2-3 slices of tomato. Fold one edge of each tortilla over the filling, roll up tightly and put them, seam side down, on a cutting board. Then cut each roll into 2 or 3 sections. Arrange them on a serving platter and get ready to watch them disappear! 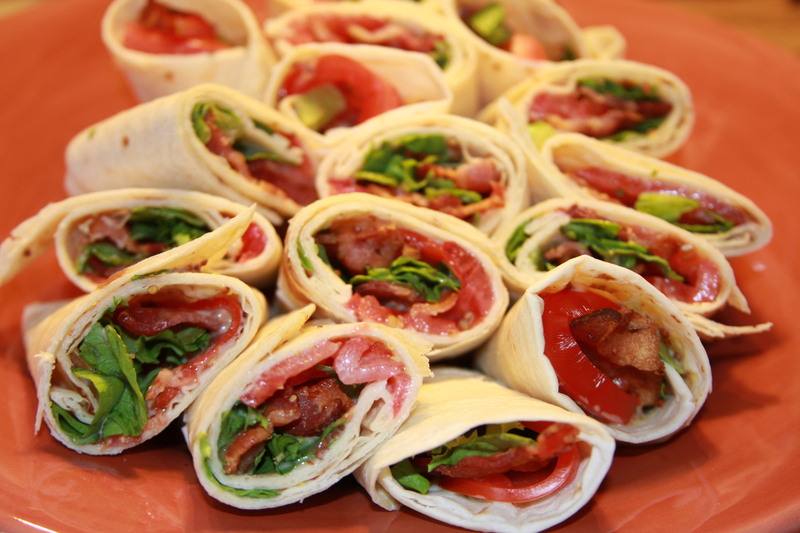 This entry was posted in Appetizers, Bacon, Dinner, Lunch, Products, Recipes, Sauces, Sides, Snacks, Vegetarian. Bookmark the permalink. Great idea for the lunchbox tomorrow! Thanks. And if you put the honey mustard separate the tortilla won’t get soggy!